Japan IT week autumn 2017 & DIS EXPO > Leader in Network Access Control ViaScope! ViaScope Inc. a leading provider of network information security and IP management technologies, will strengthen global network access control and IP resource management. To this end, the company is actively involved in the development of the Japanese market, which occupies the second largest share in the global IT market. In the second half of the year, ViaScope Inc. also participated in the "Japan IT Week Autumn 2017" and "Osaka DIS ICT EXPO 2017" exhibition. 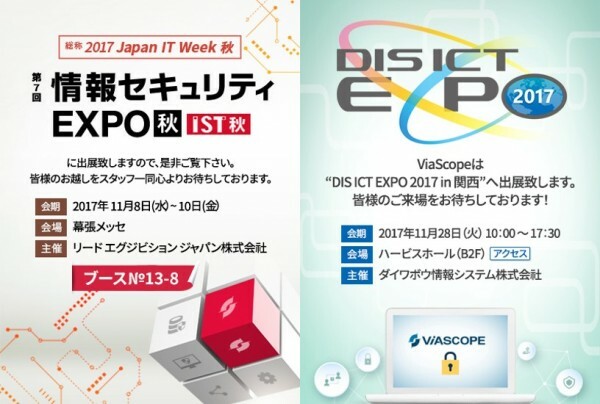 And ViaScope Inc. continues to engage in aggressive marketing by participating in major IT and information security exhibitions in Japan.